Four years ago, a company that offered to pay me almost twice my base salary and a commission structure to die for, recruited me! I liked where I was employed but didn’t see how I would be able to make that kind of money and accepted the position. I created this problem because I did not research this company and didn’t ask enough questions about the “out clause” or “non-compete”. I also ignored my intuition… I felt something was not right with this company but I let the money they were offering cloud my vision. I learned never to sign a contract without learning more about the company I am about to work with and will ask a ton of questions about “probationary” period. The gifts & lessons were many and through the process of working for this company, I made great contacts. I learned that I could rise to challenges and that I had a gift for connecting with people I just met. What is different is that I no longer sign “non-competes” and I now research my clients much better. I listen to my intuition and follow my instincts. How will I use this experience? Well, because I made so many wonderful connections, I was able to start my own company. Three hours after I hung up with that dreadful call, I had my first client. Six hours later, I had my second client! I now had the freedom to be helpful to my clients without the expectations of an employer. My goal is always to listen to my clients and by doing so I can provide the services and support they need while being true to my essence. I want to learn from you… become a teacher!!! What is your “victim” to 100% Responsibility story? In 2009 I started a relationship with my youngest son’s father. We became pregnant a year later in 2010. We agreed and planned to have a baby and start a new family together. A year after the baby arrived; we seperated due to his lying and infidelity. I was in shock, crushed, and mentally unstable due to the seperation. I started using substances to cope with the pain I felt and to escape what I refused to accept as reality. He left me to pack everything in our home by myself with no water or electricity. He did come remove the valuables like my 52″ t.v. that I paid for for a year all on my own, and the rest of the t.v.’s in the house as well. He sold my car and kept all the money while continuing to lie to me about our future. I felt like he had sabatoged and destroyed me. I could not figure out how someone I loved so much could do something like this to me since he told me, and made it seem like he also loved me, and we had just had our beautiful baby. #1. I created the infidelity and deception because that was what I was afraid of the most. I was abusive and jealous by not trusting him and asking a million questions when he was not with me. I focoused all of my passion and energy on what I did not want to ruin our relationship; therefore I caused exactly what I did not want to happen, to happen. #2. I had started dating him in 2003 when we first met, and I found out that he was already involved with someone a couple months after we started dating. I knew this and I still chose to get involved with him after having a “not so good” expierience with my feelings for him previously. #3. I also knew he did not have a steady job before I allowed him to move in to my apartment, then I would complain to him about not contributing. I did not give choices either. I told him what to do, and expected him to do things I didn’t ask him to do. #4. I was not appreciating or greatful enough for the things he was doing. Now we are co-parenting our child, and we get along and communicate almost daily. I am so grateful for the gifts and lessons I have learned from the whole expierience. I was able to figure out who I am, and fall in love with myself. Now I am whole and and ready for a helthy, loving, functional relationship with the right person. I am so proud of how you have taken 100% Responsibility… I hope, that looking back by asking these 4 questions on your current reality was helpful to you. I hope you see that you experienced these lessons in order to rise to a higher level of awareness and self love. Unfortunately, sometimes this kind of awareness only comes from experience but other times we can learn from someone else’s experience. Thank you for becoming a teacher and allowing us to learn from you! I wish you continued strength, awareness and wholeness… I know you will have the relationship of your dreams! 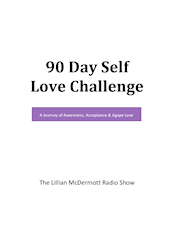 Subscribers receive a free copy of Lilly's 90 Days to Self Love as well as her Positive Affirmations Audio book. Remember, clicking "Subscribe" is just the first step. Make sure you check your email and confirm your subscription. Week of 4/22/19, on The Lillian McDermott Radio Show-Classroom!